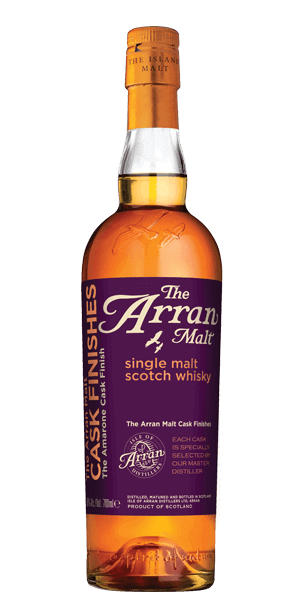 The Arran Malt Scotch Single Malt Amarone Cask Finish is as special as its very long name implies. Harold Currie was a director at the famous Whisky producer Chivas. But he knew believed he could do better. Harold was in love with the Isle of Arran, which had at one time been home to at least fifty illegal distilleries—it was convenient due to its remote location and the fact that the king’s men would have to arrive by boat, giving the Scottish bootleggers plenty of time to hide the goods. So he saved up his pennies and took on a few investors and broke ground on his dream in 1994. But two golden eagles built a nest, and construction had to be stopped until the chicks were fully fledged. But Golden Eagles must be good luck because business is still booming for the wee little Arran distillery. Today, they produce a tidy little range of single malt offerings, several limited editions, two special blends, and a Scottish cream Liqueur. Turns out old Harold was right, he COULD do it better, much better. Isle of Arran is one of those “Whiskey-insider” secrets. Because the name has “Isle” in it beginners often think that it is an “Islay” dram. It’s not. So if you are worried about being smacked in the face with peat smoke, that is not what you’ll get here at all. What you will get is a smooth, fruit-forward, almost Highland style Single malt. The Arran Malt Scotch Single Malt Amarone Cask Finish is as special as its very long name implies. After initially maturing in traditional oak casks for approximately 8 years, the Arran Single Malt in this bottling was finished in the highest quality Amarone wine casks from an artisan producer in northern Italy. Amarone is an iconic Italian red wine from Tuscany, and the finishing adds additional complexity to the already sweet malt of the Arran spirit. It packs 50% ABV, but hides it well. What does The Arran Amarone Cask Finish taste like? The Flavor Spiral™ shows the most common flavors that you'll taste in The Arran Amarone Cask Finish and gives you a chance to have a taste of it before actually tasting it. Amazing, so much better than expected!! lovely sweet. Ideal as a spring whisky. Bottled at a great strength of 50% ABV. Full of flavour. Wonderful sweetness form the amorone cask aging.